This bulletin was obtained and first published by Nigel Parry. 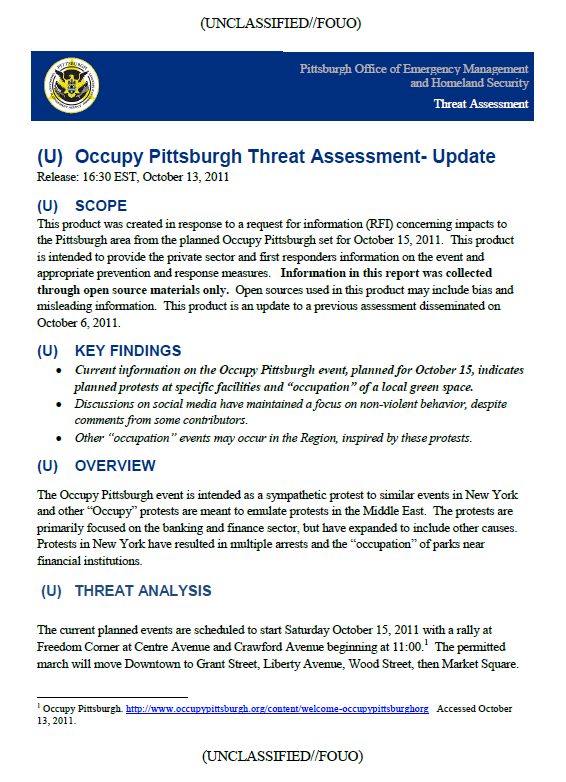 This product was created in response to a request for information (RFI) concerning impacts to the Pittsburgh area from the planned Occupy Pittsburgh set for October 15, 2011. This product is intended to provide the private sector and first responders information on the event and appropriate prevention and response measures. Information in this report was collected through open source materials only. Open sources used in this product may include bias and misleading information. This product is an update to a previous assessment disseminated on October 6, 2011. Current information on the Occupy Pittsburgh event, planned for October 15, indicates planned protests at specific facilities and “occupation” of a local green space. Discussions on social media have maintained a focus on non-violent behavior, despite comments from some contributors. Other “occupation” events may occur in the Region, inspired by these protests. The Occupy Pittsburgh event is intended as a sympathetic protest to similar events in New York and other “Occupy” protests are meant to emulate protests in the Middle East. The protests are primarily focused on the banking and finance sector, but have expanded to include other causes. Protests in New York have resulted in multiple arrests and the “occupation” of parks near financial institutions. The current planned events are scheduled to start Saturday October 15, 2011 with a rally at Freedom Corner at Centre Avenue and Crawford Avenue beginning at 11:00.1 The permitted march will move Downtown to Grant Street, Liberty Avenue, Wood Street, then Market Square. A non-permitted march is planned to take place at 16:00 and move to Mellon Green at 6th Avenue and Grant Street, near BNY Mellon. The organizers for the event have developed a legal argument for occupying the Mellon Green areas. Discussions have also included involvement of legal observers and review of First Amendment processes before the start of the march by their legal advisors. This comment and others related to violent activity have resulted in numerous disagreements with Facebook participants. Web 2.0 tools, such as Facebook, Twitter, and Google Groups are being used to coordinate and plan the event. Other related events include the current Occupy IUP (Indiana University of Pennsylvania) event and other “occupy” events could occur in other locations throughout the Region. At this time, no threat from the “hacktivist” group Anonymous has been identified. Although, the overall threat for this event in Pittsburgh is limited at this time, mitigation and preparedness activities can be considered to counter this threat spectrum. Will any individuals or groups participate in the event with propensity for violent activity and how will other participants react to violent activity? Will an occupation of Mellon Green be attempted?